Participatory evaluation ensures that the evaluation focuses on locally relevant questions that meet the needs of program planners and beneficiaries. Participatory approaches allow local stakeholders to determine the most important evaluation questions that will affect and improve their work. 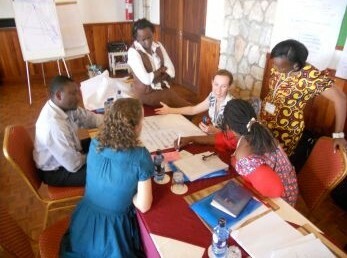 Participatory evaluation is reflective and action-oriented. It provides stakeholders, including beneficiaries, with the opportunity to reflect on project progress and generate knowledge that results in being able to apply the lessons learned. It provides opportunities for groups to take corrective action and make mid-course improvements. A participatory approach is empowering because it claims the right for local people to control and own the process of making evaluation decisions and implementing them. Participating in an evaluation from start to finish can give stakeholders a sense of ownership over the results. Recognizing local talents and expertise builds confidence and pride in the community, and among participants. Conducting a participatory evaluation promotes participant learning and is an opportunity to introduce and strengthen evaluation skills. Active participation by stakeholders can result in new knowledge and a better understanding of their environment. This, in turn, enables groups to identify action steps and advocate for policy changes. It can provide participants with tools to transform their environments. Participatory evaluation builds teams and participant commitment through collaborative inquiry. Inviting a broad range of stakeholders to participate and lead different parts of the process can develop and celebrate local leadership skills. It can lead to stronger, more organized groups by strengthening the community’s resources and networks. Finally, a participatory evaluation is not just interested in findings; it is focused on creating a learning process. It creates a knowledge base among local people and organizations, which can be applied to other programs and projects. The techniques and skills acquired can lead to self-sustained action. Structures and processes are created to include those most frequently powerless or voiceless in program design and implementation. The participatory process honors human contributions and cultural knowledge. Participants commit to work together to decide on the evaluation focus, how it should be conducted, how findings will be used and what action will result. Often the process requires addressing differences in point of view and conflicts. Participants learn together to take corrective actions and improve programs. Uses creative methodologies to match the resources, needs and skills of participants.